Graduated from St-Luc High school of Arts of Liège, professor at the Huy Academy of Fine Arts, Fabienne Withofs reveals her extraordinary graphic mastery and creative freedom in a solo exhibition entitled “Let’s drift – Make fun, Satirical allusions” at the Cultural Centre of Ciney. Her works, be they objects, sculptures or installations, are both grave and light, powerful and delicate. Opening times: Mondays to Fridays from 9 am to 12 am and from 2 pm to 5 pm; Saturdays from 9:30 am to 12:30 pm (please note: on May 19th, we are closed); Sundays from 2 pm to 6 pm. During the Pentecost weekend: closed on Saturday, May 19th; open on May 20th and 31 st from 10 am to 6 pm. Fabienne Withofs will welcome you at her exhibition : on May 20th, 21st and 27th, on June 3rd and 10th (and on request). 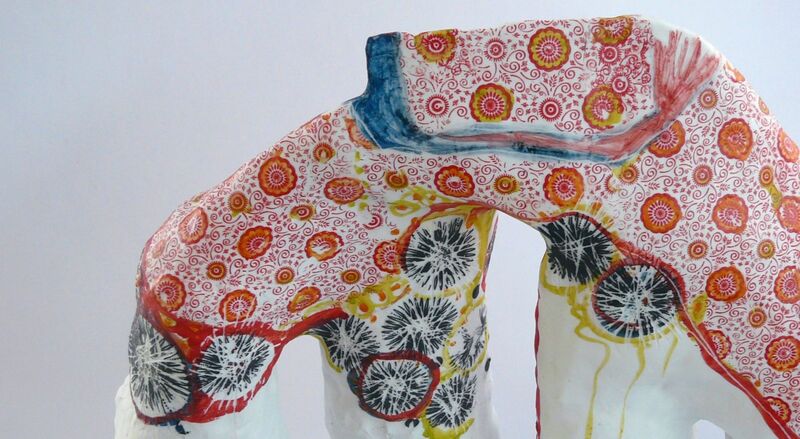 Workshop « Pour moi, par moi(s) » : “Discovering ceramics” with Elise Grevesse, on Saturday, May 26th, 2018 from 9:30 am to 12:30 pm.